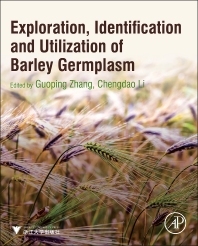 Exploration, Identification and Utilization of Barley Germplasm explores the timely global challenges related to barley production posed by the narrowing of biodiversity and problem soils, identifying elite genotypes which will enhance barley breeding and be essential to genetic and evolution studies. The book covers the utilization of barley germplasm for improving the quality of both food and feed barley as well as exploring and utilizing varieties of germplasm that are tolerant to drought, waterlogged, salt, and acid soil. Chapters are devoted to prime strategies for future research, including identifying barley germplasm by applying Omics, exploring barley germplasm by means of the Focused Identification of Germplasm Strategy (FIGS), and creating barley germplasm through mutation. Users will find this book to be a key research reference for both professionals and academics, providing a comprehensive update for established barley researchers that equips them with an understanding of the new methodologies needed for innovation and discovery, while also providing a helpful entry to the subject for young researchers and students. Professional scientists, technicians and students who are engaged in crop genetics and breeding. Agronomists, plant geneticists and plant breeding professionals, crop and plant physiologists can use this book as a reference work. 7. What Limits Use of Exotic Barley Germplasm in Breeding Programs? Prof. Guoping Zhang engages in barley genetics and breeding for more than 20 years. Up to date, he published more than 80 papers, including PNAS, Journal of Cereal Science, Planta, Theoretical and Applied Genetics, PLoS One, and 4 books. In April 2012, as a general secretary professor Zhang organized 11th international barley genetics symposium (IBGS) in Hangzhou, and been selected as the chairman of IBGS (2012-2016). Dr. Chengdao Li is a barley breeder and molecular geneticist at Department of Agriculture, West Australia (DAWA), and guest professor of Zhejiang University, China. He has extensive international experience (China, Canada and Australia) on barley breeding and molecular genetics and finished more than 10 granted research programs on barley germplasm development and breeding, resulting in development and releasing of new barley varieties “Baudin”, and “Hamelin”, identification and characterization of more than 10 elite barley genotypes with high tolerance to abiotic stress and high malt qualities. He has published more than 60 papers and 4 books.